Setting: First century Rome, Capri and Palestine [巴勒斯坦]. *to execute (an execution): to kill someone with the authority of a ruler, government, gang leader, etc. sorcery/sorcerer: magic or one who uses magic (such as to “cast a spell” or curse others). Historically, magicians/witches/sorcerers, etc. have almost always been feared as evil people, whether the things they do bring bad results or good results (such as healing people of sickness). *superstition: [迷信] irrational but strong belief in magic, good/bad luck, omens, etc. Marcellus is a Roman officer and son of a powerful Senator; Caligula is the son of Tiberius Caesar. But first we meet Demetrius, who is being sold as a slave. Caesar’s son wants to buy him to become a gladiator (one who fights to the death for sport), but Marcellus bids more money for him (to make Demetrius his personal assistant—but mainly to irritate Caligula, and it does make Caligula angry). Caligula then has Marcellus sent to the worst place in the vast Roman Empire: Jerusalem, Israel. One of his duties is to supervise crucifixions. While thus executing Jesus, he gambles for his robe, and wins—and soon after starts to act crazy/insane. Diana intercedes for Marcellus (whom she loves), and Tiberius sends for Marcellus, only to find him insane or bewitched. After deciding that it was Jesus’ robe that bewitched Marcellus, Tiberius sends Marcellus back to Israel with these instructions: “Go, find the robe and destroy it, and for Rome, seek out the followers of this dead magician. I want names of every man and woman who subscribed to this treason.” But once Marcellus gets to know some of these “followers”, he begins to think that theirs is a force for good, not evil or treason. Marcellus (and eventually Diana, too) becomes a Christian, seeking to spread and defend his new faith. Of course, the movie also features fights, death, love, honor, bravery, confusion, rebellion, compassion, and all the other things that make a story great, leading up to a memorable and surprising conclusion. The film was so popular that it led to a sequel called Demetrius and the Gladiator. 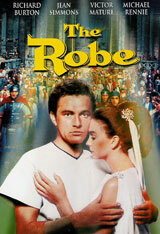 Historical note (according to IMDB.com, 2012): The Roman Emperor Caligula is depicted in this movie as persecuting Christians. However, he reigned from AD 37 to 41, while Christianity was still a very “new” religion with most of its followers in the eastern Mediterranean. The first mention of Christians from the perspective of the Roman government, according to the Roman historian Suetonius, wasn’t until the reign of his successor Claudius (reigned AD 41-54). The first major incidents of persecution of Christians did not occur until the reign of Emperor Nero (reigned AD 54-68). From the way Marcellus’ family lived, how would you describe their financial situation? If you had a lot of money, what would you do with it? Look at dialog 8. In every century and in every culture, people betray and disappoint other people. Why? Look at dialog 16. What is more important for the progress of civilization: love, power or hope? Power has built many of history’s great civilizations, but like Rome they never last. Why not? Caligula calls a group: “A secret party of seditionists; the riffraff [流氓] of the plebeian class[人民]; a party of conspirators [阴谋家].” Who is he talking about, and do you agree with this description? Look at dialog 14. What does it mean to “be cheated”? If a shopkeeper gives you too much change when you buy something, do you keep it or tell her about the error? In the movie (when the people accepted too much money from a stupid merchant), who was being cheated (do you agree with Justus)? Explain. What are some ways that people “cheat themselves”? At the end, Diana made a difficult choice. Tell us about a difficult choice you had to make, and tell us where you found the strength to make it. It is said that “If you don’t have something to die for, then you don’t really have anything to live for.” Do you agree with this saying? Why or why not? Did Marcellus and Diana believe it? Tell your partner about someone (you know, or in history) who “had something to die for”–and the difference that made to the way people think of them. 1. Diana: Then all the tales I’ve heard of you are true. Marcellus: Every man makes enemies. Diana: All your enemies seem to be women. 2. Diana: It’s good to see you, Marcellus. Marcellus: It’s ah – good to see you – again. Diana: Then you do remember me? Diana: And your promise, have you forgotten that too? Diana: That’s not very flattering, Marcellus. Diana: Oh, I remember them perfectly. I’d cut my finger, and I cried. And then you took the dagger and cut your own finger to show that it didn’t really hurt, and then you kissed me, and I stopped crying – and then you promised to marry me when we grew up. Marcellus: Diana! Where have your freckles gone? Marcellus: Oh, I loved every one of them. Diana: Then I’m sorry I lost them. Marcellus: Don’t cry, my love. Lucia thought I was in love, and I laughed at her, but women are wise in these matters. 4. Demetrius: Make Pilate understand that if he stains his hands with his blood, he’s worse than a murderer. 5. Pontius Pilate: Give me water to wash my hands. 6. Jesus Christ [dying on the cross, under Marcellus’ supervision]: Father, forgive them, for they know not what they do. 7. Demetrius [awaking to darkness]: Is it night? Jerusalem woman aiding Demetrius: No. It’s the middle of the day. This isn’t like other days. 8. Demetrius: Why was he betrayed by one he loved and trusted? Demetrius: Wait, tell who? Who are you? 9. Demetrius: [to Marcellus] You crucified him. You, my master. Yet you freed me. I’ll never serve you again, you Roman pig. Masters of the world, you call yourselves. Thieves! Murderers! Jungle animals! A curse on you! A curse on your empire! 10. Marcellus [waking up from a nightmare of Jesus being nailed to the cross]: No! No! Stop it! Stop it! [he runs out on deck] Stop it! Why don’t you stop it! Ship’s captain: Stop what, sir? 11. Emperor Tiberius: Tell me, what was your impression of [Governor] Pilate? Emperor Tiberius: I’m asking you. Did you find him capable? Marcellus: Yes sire, he’s considered a good administrator. Emperor Tiberius: Stern, as befits a Roman governor? Marcellus: I’m sure of that, sire. Marcellus: I – I can’t say. Emperor Tiberius: Why not? Surely you can give me some sort of an answer? Tell me, tribune – what happened out there? 12. Emperor Tiberius: Tribune Gallio, you are a Roman officer. I command you to gain control over yourself. 13. Marcellus: I lost my wits when I put on the robe. Doctor: The clue to this man’s sanity is… in the robe that bewitched him. Caesar: Go, find the robe and destroy it, and for Rome, seek out the followers of this dead magician. I want names of every man and woman who subscribed to this treason. 14. Marcellus: A man is not cheated when he’s satisfied with a price. Justus: But you weren’t the real loser. They were only cheating themselves. 16. Miriam: He asked us to build our lives on love; to build a new world. Marcellus: Worlds are built on force. Power is all that counts. Miriam: Perhaps we have something better than power. We have hope. 17. Marcellus: Surely you don’t believe he rose from the dead. Justus: He lives more surely than we do. Marcellus: He’s DEAD! And no moonstruck girl can sing him to life again! Justus: How do you know that he’s dead? Marcellus: The soldier told me. The soldier who saw the lance thrust into his side. The soldier who was – out there! Marcellus: Were you out there? 19. Emperor Tiberius [counseling Diana to forget about Marcellus]: For your sake I interfered, when my wife wanted to give you to Caligula. For your sake I brought your tribune back from Palestine. For your sake, I now free you from him. Diana: Sire, I have no wish to be free. Emperor Tiberius: Have you gone mad too? Diana: He had everything then. He could have had me too. I wanted him, but I wasn’t sure that I loved him. Now I am sure. Emperor Tiberius: I see it my duty to forbid you to see him again. As a child you were wise, but now you reason like a woman – foolishly. 20. Emperor Tiberius: After forty years with Julia, my approaching death holds few terrors for me. 21. Emperor Tiberius: When [the end of the empire] comes, this is how it will start. Some obscure martyr in some forgotten province, then madness. Infecting the legions, rocking the empire, then the finish of Rome. 22. Demetrius [to Marcellus, after Marcellus finally finds the Robe again]: You’re afraid, but you really don’t know the reason why. You think it’s his robe that made you ill. But it’s your own conscience, your own decent shame. Even when you crucified him you felt it. 23. Demetrius: Until now you only remembered what you did to a man. The wrong, and your shame. But now – you remember the man. Marcellus: [stammering, pointing to himself] I… crucified him. Peter: I know. Demetrius told me. Marcellus: [shocked] And you can forgive me? Peter: He forgave you from the cross. Can I do less? Now, is there anything stopping you? Can you become one of us? Marcellus: [new strength in his voice] From this day forward, I am enlisted in His service. I offer Him my fortune, my sword, and my life. And this I pledge to you on my honor as a Roman. 25. Caligula [telling the guards to stop torturing Demetrius; they want him to reveal where Marcellus is hiding]: Enough for now. He’s no use to us dead. 26. Diana [after meeting Marcellus after a long absence]: Are you still ill? Marcellus: No, I’m well. Really well, for the first time in my life. 27. Diana: No, Marcellus, they’ll kill you! Diana: Faith in what? This new God of yours? How can he help you? He couldn’t help his own son, they crucified him! 28. Caligula: You put him to death? Then why are you risking your life for him? Marcellus: I owe Him more than my life. If you don’t want to know the end of the movie, stop reading here. 29. Diana [Marcellus has just been sentenced to execution; Diana leaves the podium to stand at his side]: Sire, Marcellus is my chosen husband. I wish to go with him. Caligula: Stand back! You’re not on trial! There’s no evidence against you! Diana: Then if it please you, sire, I’ll provide evidence. I have no wish to live another hour in an empire ruled by you! You dare to call yourself a Caesar. Once the Caesars of Rome were noble, but in you, noble blood has turned to poison. You corrupt Rome with your spite and malice. Diana: That you should be Caesar–vicious, treacherous, drunk with power, an evil, insane monster posing as emperor. Diana: As for me, I have found another king. I want to go with my husband into his kingdom. Caligula: Then, by the gods, you shall! Go, both of you, into your kingdom! [(i.e., “I sentence you both to die immediately;” then soldiers take Diana and Marcellus away] They’re going into a better kingdom! They’re going into a better kingdom! They’re going to meet their king! They’re going to meet their king! ©2010 Michael Krigline. See our Website Standards and Use Policy.